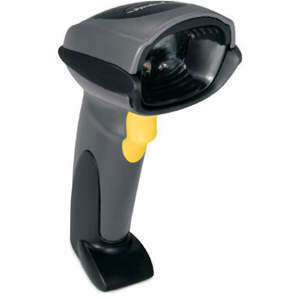 The Symbol DS6708-SR Barcode Scanner is a handheld scanner designed for quick and careful digital imaging. This CMOS scanner is compatible with multiple barcode types like Australian Post, Bookland, Codabar, Code 128, Code 128 Full ASCII and many others. With a maximum working distance of 15.2 inches and a 1.3 MP camera, this 1D barcode scanner captures precise details and improves worker performance. Store the collected data in your computer from the 2D barcode scanner, by using its transfer cable. Built with durability in mind, it can survive a 6 ft. drop on concrete. To inform you when the item has been scanned and recorded, its LED light indicator blinks and a beep sound goes off. We can help. For more information about the DS6708-SR, or any of our products and services, call us at 1.800.457.8499 or email us. Order your DS6708-SR now. Your purchase order, with credit approval, is welcome, as well as all major credit cards, PayPal and Google Checkout. Remember, you'll get FREE technical service with every product you buy from Vecmar.